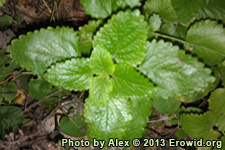 Lemon Balm is a perennial (its root survives the winter) herb usually growing 1-2 feet (50 cm) tall. The leaves are ovate to heart-shaped and mint-like. Its flowers are white to yellowish in loose, small bunches and have a lemony-minty smell and flavor. Lemon Balm is used in foods and teas, as an insect repellant, and there is evidence that it has anxiolytic, sedative, mood improving, and nootropic effects. Some people report distinct psychoactive effects taking it as a tea, snorting, or smoking it, sometimes in combination with other plants or drugs, though reports are inconsistent.